Directions This building is situated seven and a half miles to the north of Lincoln, adjacent to the A15. Description The gateway with its attached lodges and wall is a former entrance to Fillngham Castle. Built in 1775 of limestone ashlar, they were possibly designed by John Carr. 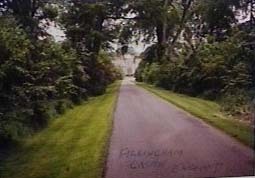 The building commands views of Fillingham Castle, which is listed grade II, across a landscaped park. Reason for Risk From the roadside there appears to be little wrong with these buildings, but when viewed form the park it is possible to see that the lodges have suffered partial structural collapse, with bowing walls and missing roof tiles. I used the "Feedback" button on the top of the page, to send an e-mail to the Heritage Trust of Lincolnshire. I asked if anyone knew anything about the history of the castle, or where I could go to research it. Below, is what I received. Sir Cecil Wray is said to have built this Gothic Castle in 1760. It is a large square Gothic castellated mansion, with a circular bastion tower at each corner. John Carr may have been employed to design it. The Wrays of Fillingham were descended from Lord Chief Justice Wray who settled at Glentworth in the reign of Elizabeth I. The last Sir Cecil Wray, died at the castle in 1805 and his lady in 1825 aged 89. In Whites 1856 Lincolnshire John Dalton was Lord of the Manor and owner of the parish and resided in the Castle occasionally. Pevsner in The Buildings of England Lincolnshire writes about the Castle so it is still standing. I know English Heritage and the National Trust do not own the Castle so it must be privately owned. Thank you very much for your help with the Fillingham Castle. 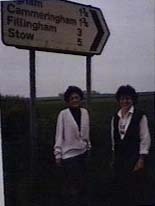 I am working with about 50 other people on our family genealogy, which comes from the surname, Fillingham. Your thoughtfulness has helped dispel some of the legends floating around over here in the US. Thanks for helping us understand!